Angus residents who pay for garden refuse collections have been promised a month of free collections after a strike meant bins went un-emptied. 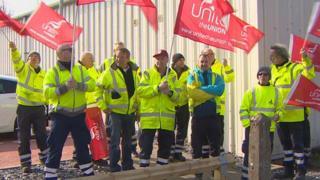 Staff have started industrial action over changes to their shift patterns, which meant that last week only about half of collections were made. Garden waste collections were especially affected, the council said. The union has complained the shift changes have affected the work/life balance of members. The collection times have been rescheduled to begin at 06:00 and finish at 22:00, which Unite say takes away members' ability "to take part in family life on a daily basis". Following the disruption caused by last week's strike Angus Council has confirmed that the 20,000 households with a current garden waster collection subscription will get an extension of one month added for free. Eleven more 48-hour stoppages are planned over the next three months. The council said there would be significant impact on kerbside collection services. Residents have been advised to put bins out on scheduled collection dates and wheel them back in if they are not collected. General waste skips will be available at all recycling centres during the strike. Angus council said the changes were an essential part of the cuts needed to save £36m over the next three years. Councillor Mark Salmond thanked the staff who did not strike, and said they ensured the collections that did happen went ahead. He added: "I am acutely aware that many people who have paid for their garden waste to be collected are not currently receiving those collections. "We cannot be certain how long this strike action will last - that is a matter for Unite and its members. "But we will continue to monitor the impact on the service and ensure that those who have paid for the service are not financially disadvantaged, while seeking solutions to minimise disruption to the overall refuse collection service." Unite's regional co-ordinating officer, Dougie Maguire, has previously outlined the reasons for the strike. He said: "The one thing that persuaded them to continue doing the worthwhile but difficult job that they have been doing was their work/life balance, and the ability to take part in family life on a daily basis. Angus Council has unilaterally taken this away from them. "They will also start an hour earlier with no public transport available. "On the back shift, which finishes at 22:00, some will need to wait 45 minutes for a bus back to their town or village."